Do you work with or support young adults dealing with addiction in an educational or support setting, such as a school or university (CRC), or another community-based organization (CBO or RCO)? SMART Recovery would like to assist you in making our science-based, religion-neutral approach to addiction recovery support available for your school, CBO, or university by providing our training to your volunteers or staff at a significantly reduced rate. As a non-profit, we understand that making programs available is a challenge with a limited budget... and we'd like to help. Those wishing to offer SMART Recovery meetings for young adults can be trained for a $35 registration fee (normally $75), and once trained and registered, your organization will be able to order our handbooks at a discounted rate as well. Our 3rd Edition Handbook is designed for a wide audience, including young adults. It’s our desire to partner with various organizations to bring young people throughout the world the support they deserve. Our staff and training team are available to brainstorm ways our organizations can collaborate to benefit young people in recovery. Let’s work together to reach and benefit the maximum number of young lives. Give us a call at 440-951-5357 or contact us to learn more. Together, We Can Change Young Lives! 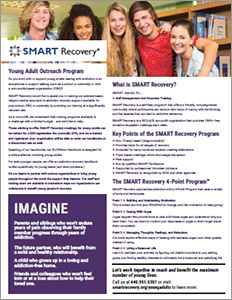 Support SMART Recovery's Youth Initiatives with your US tax-deductible donation. Your generous gift helps train more youth leaders, and supports our outreach programs to make our no-stigma, religion-neutral empowering approach available to more young adults. You can make an immediate difference for many young adults as they navigate their way through the challenges facing them today. Download our Young Adult Outreach Program flyer (PDF) here. SMART Recovery is a self-help program* that offers a friendly, non-judgmental community where participants can explore new ways of coping with the thinking and the hassles that can lead to addictive behaviors. 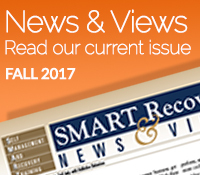 SMART Recovery is a 501(c)(3) non-profit organization that provides 1500+ free, donation-requested meetings each week. Find a SMART Recovery meeting near you! Urges happen! We provide tools to deal with these urges and understand why you have them. You can learn to control your responses to urges or even forget about them completely. Our tools explain effective ways of dealing with sadness, anger, and other upsets, instead of using. Learn to maintain your sobriety by figuring out what's important to you, setting goals, and finding healthy interests to ultimately live a balanced and satisfying life. 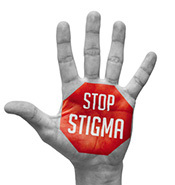 Let's work together to help young adults in your area find the addiction recovery that's "right" for them!